Its been almost two years since we last saw Regina Spektor live, at Hammerstein Ballroom in 2007. We had a ticket to the McCarren Pool show last summer, but torrential rains kept us away. It was with that level of excitement that we entered the new Beacon Theatre to hear the first-ever live performances of much of Regina’s new CD, Far, due for release next week. As anticipated, the new material is more mature and elaborate — she played with a string section and drums — but still very much maintains the charming attraction of older Regina material. Of the new songs, the pre-released single “Laughing With” shined the brightest. The second half of the set was dedicated to many of Regina’s older and more familiar material — but also included three chestnuts, the infrequently played “Consequence of Sounds”, the b-side “Riot Gear”, and a new song preliminarily called “The Holocaust Deniers”. The latter song sounds like a straightforward rebuke of the title characters “who accuse the dying of lying”. We recorded this set from a nearly perfect location, a direct line about 30 feet in front of the huge PA stacks on the left side. Our best mobile rig captured a recording of stunning clarity, with two caveats — the volume of the obviously excited crowd had to be reduced significantly in post-production, and during the quiet moments there is an apparent hum/buzz in the left channel which I believe was caused by the air-conditioning duct directly above my head. Under the circumstances, we nevertheless feel this is an excellent capture. Enjoy! 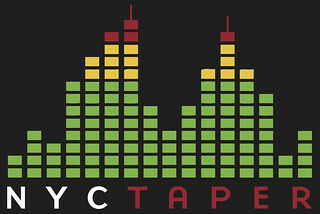 If you email nyctaper for access to this recording, we expect that you will PLEASE SUPPORT Regina Spektor, visit her website, visit her MySpace page, and purchase/pre-order her new release Far directly from her website [HERE]. I guess I missed “Riot Gear” when I wrote my setlist, but the tape doesn’t lie right? AWESOME. Thank you for sharing! Some of us live in places where seeing Regina in concert will just not be happening. Thanks very much Dan – your generosity is always appreciated! THANK YOU SO MUCH!! This is incredible! I’m a bit late, but still: thanks for sharing! i’m extra-late but nevertheless THANKS!